Plast Aesthet Res 2018;5:44.10.20517/2347-9264.2018.32© The Author(s) 2018. Department of Plastic Surgery, University of Utah, SLC, UT 84123, USA. The omentum is a well-established pedicled flap for coverage of intra-abdominal and thoracic pathology, and as a free-flap for a multitude of applications. Its use as a pedicled flap for extra-abdominal applications other than those on the chest is less well described. 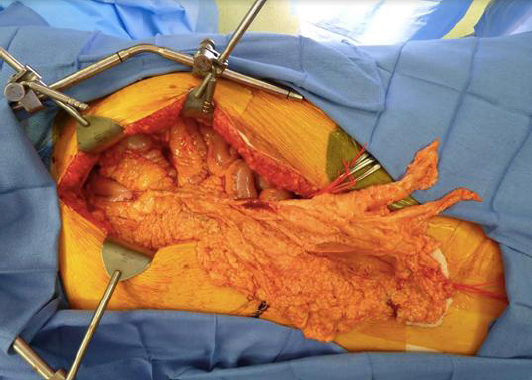 Here we present a case where a pedicled omental flap was utilized to provide circumferential and buried coverage of an in-line ilio-femoral bypass graft well below the level of the inguinal ligament. The reach of the omentum was more than adequate, and the delicate nature of the flap provided excellent circumferential coverage of a cryo-vein bypass graft. Salvage of infected vascular bypass grafts continues to present one of the most complex reconstructive algorithms for both vascular, and plastic surgeons. Graft infection necessitates graft explantation and extra-anatomic bypass, most often with additional synthetic material. These multiply comorbid patients suffer long periods of convalescence in the ICU with attendant bed-rest, ventilator dependency and sepsis. The omentum is a well established source of intra-abdominal coverage for gastrointestinal (GI), urologic, and vascular anastomotic coverage[1-3]. As a pedicled flap it is often used to cover extra-abdominal pathology on the thorax, and as a free flap it may be used in any location[4-8]. However, its use as a pedicled flap for extra-abdominal reconstruction has hitherto been largely limited to chest wall reconstruction. 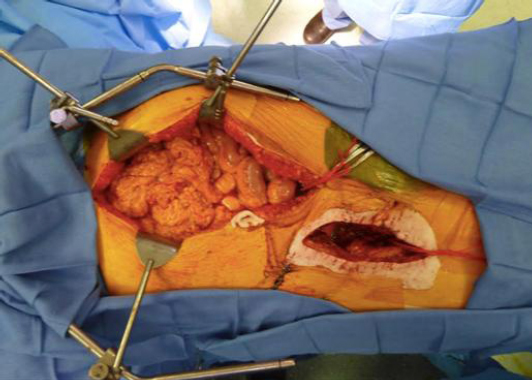 Here we present a case where a pedicled omental flap reached well below the inguinal ligament to provide circumfrential coverage of a vascular bypass graft. A 46 year-old male with past medical history significant for obesity, type-two diabetes, and ventricular bigeminy presented to outside emergency care with recurrent chest pain consistent with acute coronary syndrome. Cardiac biomarkers were negative, however the recurrent nature and severity of symptoms generated enough concern that the patient was taken for cardiac catheterization, whereupon no significant stenosis was discovered. The patient was diagnosed with likely upper GI pain and discharged to home. In subsequent follow-up a common femoral pseudoaneurysm was diagnosed as a complication of cardiac catheterization and the patient was taken for open repair by the vascular surgery service. At the time of pseudoaneurism repair a large arteriotomy was discovered that required circumferential common femoral artery excision and interposition poly tetra fluoro ethylene (PTFE) graft repair. Two days later the patient was taken back to the operating room with a floridly infected PTFE graft and underwent graft excision and cryo-vein reconstruction. At this time plastic surgery was consulted and we performed a pedicled rectus femoris muscle flap for soft-tissue coverage. Further complications ensued: six months later the patient was noted to have a large retroperitoneal hematoma as a result of graft rupture. This was rapidly treated with retroperitoneal washout by the vascular surgery service. A covered stent was placed across the new vascular defect that covered the take-off of the ipsilateral deep inferior epigastric artery, which would prove to complicate reconstructive options going forward. The wound again underwent serial debridement and antibiotic bead therapy under the care of the vascular service with plastic surgical consultation. During this time plans for definitive reconstruction of both the vascular pathology as well as soft tissue coverage were made. Vascular surgery planned to perform open excision of the covered ilio-femoral stent and replace this with a new cryovein conduit. Following vascular reconstruction, plastic surgery was presented with two wounds. The first a chronic, and serially debrided groin wound with indwelling vascular bypass graft. The second, a midline laparotomy [Figure 1]. Lengthy discussion was held regarding the method of soft tissue coverage. Because the take-off of the deep inferior epigastric artery was stented across, an ipsilateral pedicled rectus abdominus muscle was not available. The patient had already undergone pedicled rectus femoris transposition, and the plastic surgery service was concerned that additional muscular flaps from the same leg would result in prohibitive disability, especially as the patient previously had an ipsilateral femoral and iliac vein deep vein thrombosis (DVT). Additionally, most of the pedicles for local flap options were “in the zone of injury” of multiple operative debridements and a lengthy period of local infection and inflammation. Free tissue transfer was also discussed, including free latissimus dorsi and free contralateral antero-lateral thigh (ALT), however, the patient’s clinical condition after prolonged ICU care was seen as potentially prohibitive of these measures. The plastic surgery service elected to perform pedicled omental flap coverage. Plastic surgery was able to mobilize the patient’s omentum based on the right gastroepiploc artery by dividing the left gastroepiploic artery and serially dividing the arcades to the greater curve of the stomach to within 8 cm of the pylorus. The omentum was unfurled by dividing the entirety of its attachment to the transverse colon and by separating the inner and outer lamellae. Following this dissection, the omentum easily reached below the base of the groin incision to the middle third of the thigh [Figure 2]. The anatomic course of the ilio-femoral bypass under the inguinal ligament was digitally dilated to allow for the passage of the cryo-vein bypass graft in addition to the omental flap, which was wrapped circumferentially around the graft over its entire length. Following this, both wounds were closed primarily, over closed suction drains. Post-operatively the patient was kept on bed-rest, and a graduated ambulation protocol was subsequently initiated. The patient was eventually discharged to a local skilled nursing facility. There was evidence of minor superficial wound breakdown at the inguinal crease, which was also the point of maximal tension in our closure. The wound opened over 2 cm in length and 1 cm in depth. This was managed with wet to dry dressings and subsequently resolved [Figure 3]. Six months after reconstruction the patient is ambulatory and there are no indications of recurrent graft infection or vascular compromise. 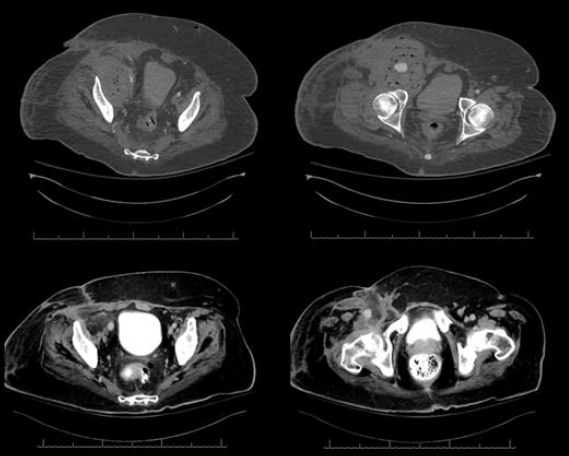 Pre, and post-operative CT images detail the presence of impressive phlegmon with air-fluid levels and subsequent resolution with a functional graft circumferentially wrapped in an omental sheath [Figure 4]. Since surgery the patient has suffered significant GI pathology in the form of nausea, poor oral intake, esophagitis, and duodenal ulcer, though the relation of his GI complaints either to his initial presentation, or to the omental flap is unclear. Soft tissue coverage of exposed or infected vascular grafts in the groin presents a difficult challenge for vascular and plastic surgeons alike. In these cases, even when simple soft tissue coverage is available, more robust vascularized tissue is often preferable. A number of established local muscle flaps exist for coverage of femoral bypass grafts including the sartorius, rectus femoris, and gracillis. However, in the multiply re-operative groin these options may have already been exhausted the rectus abdominus may also be used, but in our patient the deep inferior epigastric artery (DIEA) had been stented across at the time of secondary pseudoaneurysm repair and was therefore not an option. In our patient there were little to no options for pedicled reconstruction. In considering free flap reconstruction we evaluated the free ALT and latissimus dorsi, however we preferred to avoid protracted operative time in this multiply comorbid and multiply re-operative patient who had undergone a long ICU course including iliac and femoral vein DVT in the affected extremity. Omental flaps are well described for chest wall reconstruction based on the right gastroepiploic artery. The omentum functions as a physical and immunologic barrier in the abdomen in its native position, and for this reason it is a favorite of general and urologic surgeons for covering anastomoses[3,5]. As a pedicled flap for extra-abdominal and extra-thoracic wound coverage, the omentum is less well documented. In our case the omentum provided an excellent source of circumferential coverage for an inline vascular graft under the inguinal ligament and was delicate enough not to compress a cryo-vein conduit. Additionally, the remaining transposed omentum filled much of the dead space in the large groin wound. Regarding the reach of the pedicled omental flap, there is little documentation. The size and length of the omentum differs between people widely. Slender people tend to have less robust omentum, however, it is not always the case that a protuberant abdomen contains a large omental drape, as in many cases mesenteric fat makes up a good proportion of intra-abdominal adiposity in the obese population. The importance of disinserting the deep lamella of the omentum from the transverse colon cannot be overstated for achieving sufficient length for extra-anatomic applications. Furthermore, by unfurling the internal and external lamellae the length of the apparent omentum may theoretically be doubled. Though GI complications are known to result from omental flaps, in our patient it is not clear if GI symptoms are a complication of the intervention, or if they are reflective of his inciting pathology. For, the chest pain that he initially underwent negative coronary angiography for was ultimately attributed to recurrent upper GI symptomatology. The possibility that these GI complaints are a complication of omental flap is worthy of consideration, and if other pedicled flaps are available in a patient such as this, avoiding these complications should be of prime consideration. In conclusion, we propose that the pedicled omental flap be considered as a viable option for extra-abdominal vascular coverage option in the groin when either, the abdomen is already open for proximal vascular reconstruction, or when local muscular flap options have been exhausted, or in any case where circumferential graft coverage is required in a confined space. IRB approval was not required for this case report. Consent was obtained from the patient for publication of images and details of the clinical case discussed. 1. Shokrollahi K, Whitker I, Nahai F. Flaps: practical reconstructive surgery. NY: Thieme; 2017. 2. Hoballah JJ, Mohan C, Nazzal MM, Corson JD. The use of omental flaps in abdominal aortic surgery: a review and description of a simple technique. Ann Vasc Surg 1998;12:292-5. 3. Turner-Warwick RT, Wynne EJ, Handley-Ashken M. The use of the omental pedicle graft in the repair and reconstruction of the urinary tract. Br J Surg 1967;54:849-53. 4. Giordano PA, Griffet J, Argenson C. Pedicled greater omentum transferred to the spine in a case of postoperative infection. Plast Reconstr Surg 1994;93:1508-11. 5. Hultman CS, Carlson GW, Losken A, Jones G, Culbertson J, et al. Utility of the omentum in the reconstruction of complex extraperitoneal wounds and defects: donor-site complications in 135 patients from 1975 to 2000. Ann Surg 2002;235:782-95. 6. McLean DH, Buncke HJ Jr. Autotransplant of omentum to a large scalp defect, with microsurgical revascularization. Plast Reconstr Surg 1972;49:268-74. 7. Reade CC, Meadows WM Jr, Bower CE, Lalikos JF, Zeri RS, et al. Laparoscopic omental harvest for flap coverage in complex mediastinitis. Am Surg 2003;69:1072-6. 8. Wallace JG, Schneider WJ, Brown RG, Nahai FM. Reconstruction of hemifacial atrophy with a free flap of omentum. Br J Plast Surg 1979;32:15-8.